I don’t want to be a Tec Diver so what can Tec Diving do for me? If you love to dive on reefs, take photos, enjoy diving in the sunlight bathed shallows or just want to enjoy easy relaxed diving you may think Tec Diving has nothing to offer you, but just as you don’t need to be a Formula One driver to benefit from the innovations that have filtered down to make normal road cars safer and easy to drive, so you can benefit from what cutting edge divers have learnt and passed on. Probably the most obvious contribution tec diving has made is the constant innovation and refinement of diving equipment. It takes time to trickle down but we now regularly see single cylinder wing and backplate systems with long hose configurations that keep the diver in a beautiful position while they dive, ensure they are uncluttered and streamlined plus are able to respond to out of gas emergencies with ease and flexibility. Use of sidemount wing systems is not quite so widespread yet but with mainstream manufacturers bringing out systems designed for the open water diver which are extremely lightweight, streamlined and easy to use I don’t think it will be long before sidemount diving is the second most popular PADI specialty (EANx is the most popular). The hottest equipment on the block at the moment is undoubtedly the rebreather. Since Poseidon launched the MkVI a few years ago and PADI launched their range of rebreather courses in 2011, the world has started to see rebreathers as a tool for recreational diving, as well as tec. Rebreathers give divers greater no decompression time because they optimize the gas mix at each depth, they are also quiet because they don’t give off many bubbles so are a great tool for photographers and wildlife enthusiasts. Recreational rebreathers such as the Poseidon MkVI and Se7en, Ambient Pressure Diving Evolution and Inspiration Rec and Hollis Explorer are much simpler that their tec equivalents. They are designed to be assembled with ease and have sophisticated electronics to help you both pre dive and underwater. Diving within the recreational envelope, the response to all serious problems is to ascend, either still on the rebreather or using open-circuit bailout procedures. Electronics monitor the rebreather and advise you when it is time to ascend due to the most pressing limitation, for example you are close to reaching your no deco time. Of course, there are some things a diver still has to do, such as monitor the system, but that is no more arduous than checking your SPG and if you forget something the rebreather will beep, buzz and flash messages at you until you pay attention. That’s not an excuse to forget to monitor it, of course, but an illustration of how good recreational rebreathers are at supporting our efforts. It’s not just equipment though. Dive technique is an important tool for any diver. 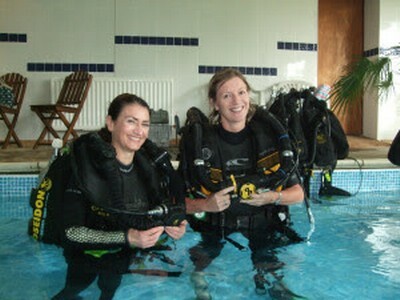 Tec training emphasizes good body position, efficient fining techniques and above all excellent buoyancy control. 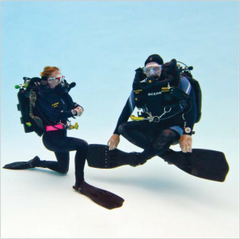 In conjunction with the right equipment improved dive technique can massively reduce a diver’s gas consumption as well as make them more comfortable in the water. Increased comfort leads to better awareness and divers who are relaxed and open avoid problems because they see them before they develop into a full blown nightmare. Tec diving also focuses on skill practice. Skills are practiced in realistic scenarios and fine tuned until they can be performed with ease. Tec divers practice at least one skill on every dive so that they remain familiar and comfortable with problem management. If problems do occur, a relaxed, neutrally buoyancy diver who is confident in their skills responds calmly but quickly to solve the problem, help another diver or abort the dive if necessary. If you want to dip your toe is, but aren’t sure about getting wet, why not sign up for the Sidemount Diver course. While Sidemount is not a tec course it does cover everything we have been talking about above. If you are a keen photographer or gadget mad the Rebreather Diver Course will open you up to a whole new world of diving still within recreational diving limits. The Tec 40 Diver course can be completed on a single cylinder and pony set up, sidemount or backmount doubles and is an ideal introduction to the equipment and training concepts of tec diving. The course can be used as a way to increase your skills and knowledge without needing to dive any deeper or longer than a PADI Deep Diver does or it can be a stepping stone into further TecRec training if you get bitten by the tec.